At the center of every Bertucci’s lives our brick oven. For over 30 years, since our first kitchen opened in the Davis Square neighborhood of Somerville, MA in 1981, we’ve been perfecting the art of brick oven cooking. From the beginning, we’ve built a tradition of creating unique pizzas and pasta combinations. These recipes all share some very important things in common. They use only the freshest ingredients, and we take the time to make each by hand. Today, 88 Bertucci’s restaurants are firing up brick ovens from New England to Virginia, each reflecting the distinct character and local charm of their community. But like the original Bertucci’s, every kitchen is also open, making our brick oven part of the restaurant experience. We believe that watching your food being prepared is an integral part to enjoying it. 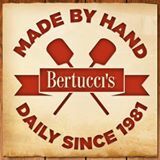 With a strong and dedicated commitment to hospitality, we welcome you as our guest, and we promise to always treat you as part of the Bertucci’s family.